We have a whole host of resources on our website for you to explore. Some are listed below, and those which are subject specific are listed by subject down the right hand side of the page. Unless stated otherwise, all resources are free to view. Although these resources are available to download free of charge, we would welcome a small donation to cover our costs and support the developing work of CiS. Please click this link to make a donation. 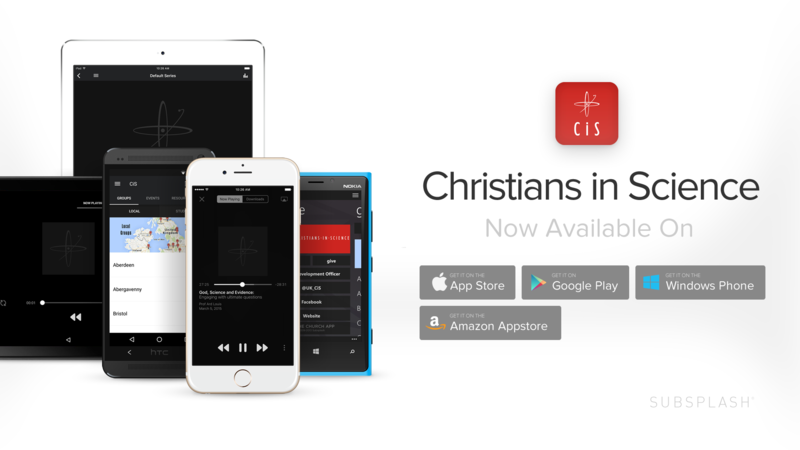 You can now download the CiS app to your smartphone or tablet to get all our CiS resources, plus events and local group information, on the go! It’s completely free, and available in the app-store. CiS have published a new set of resources for non-scientist Christians, to help address issues of science and faith. See all sixteen titles. See our promotional material, and email the Development Officer to order these resources free for your church! The “Being a Christian in…” series is written by students and professionals in collaboration to consider what it’s like to be a Christian in different scientific fields. Written with a student audience in mind, these resources are a useful encouragement to anyone considering what it is to be a Christian in their field. For information about Christians in Science as an organisation, you can view our brochure. If you would like print copies of this brochure for your local group, church or event, please contact the Development Officer. 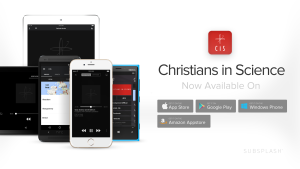 If you are speaking at other events, these slides show some of the resources available at CiS. Click here to download PowerPoint presentation. This new online magazine is a collaboration between CiS and our American sister organisation, the ASA. The magazine features a broad range of content with essays, poetry, cartoons, feature articles, stories, and more about the intersection of science and faith. View God and Nature. Science and Christian Belief is a professional journal, founded in 1989, concerned with the interactions of science and religion, and is sponsored by Christians in Science and the Victoria Institute. The journal is published twice a year and is made available free of charge to all our members as an integral part of membership. It may also be obtained direct from the publishers – full details are on the Science and Christian Belief web site. We have a growing number of online articles, talks and links on a wide variety of topics. To browse these by topic please click here or use the topic links on the right. Also consider browsing through our Past Conferences and Local Groups sections for slides, transcripts and recordings of talks from previous CiS events. Dr Oliver Barclay was a co-founder of Christians in Science (formerly the Research Scientists Christian Fellowship) and the journal Science and Christian Belief. To listen to a Thanksgiving service for Dr Oliver Barclay click here or to read The Times Obituary for Dr Oliver Barclay (published Friday 4th October, 2013) click here. The Faraday Institute, based at St. Edmunds College Cambridge, is closely linked to CiS and has a huge range of lectures and other resources. Revd Dr John Polkinghorne’s Q&A page John Polkinghorne tackles his most frequently asked questions. Test of FAITH Introductory resources from The Faraday Institute on science and faith. Transform Work UK An organisation aiming to encourage and equip Christians in the workplace through Christian Professional and Sector Groups, and Christian Workplace Groups.